The importance of John the Baptizer may be gauged by the amount of paint and ink the Church spends on him. His portrait is painted and is found on every single icon-screen in all the churches, regardless of whether or not he is that church’s patron saint. And many hymns have been written to celebrate his life. Much ink is required for these hymns—he has many feasts. 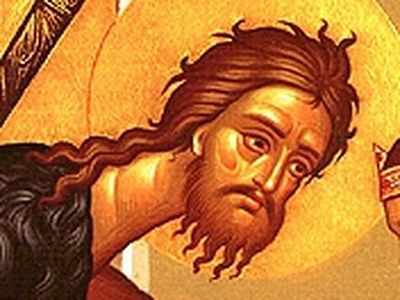 Fifty-seven feasts each year in fact: the feasts of his conception on September 23, his birth on June 24, his beheading on August 29, the synaxis celebrating his role as the Lord’s baptizer on January 7, the feasts of his relics on February 24 and May 25, and every Tuesday of the 52 weeks of the year, which celebrate him in the weekly liturgical cycle. That is a lot of feasts, requiring a lot of hymns. This should only be expected for someone the Lord described as the greatest born of women (Matthew 11:11). Yet, as the Lord went on to say, even the least of those in the kingdom was greater than John, for John stood outside the coming kingdom, suffering death at the hands of Herod before he could enter it himself. 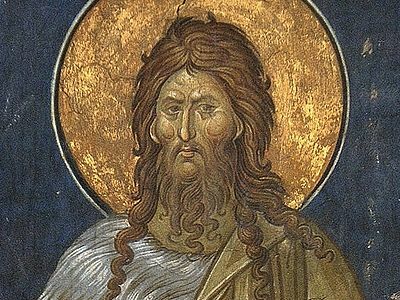 John was, in fact, the embodiment of the Old Testament’s message, and as such he stood at the end of the long line of sacred history. “All the prophets and the Law prophesied until John” (v. 13); John was the final prophet, the seal of the prophets, for after him there could be no more Old Testament prophecy. He was the prophetic hinge, connecting the Old Covenant with the New. In his ministry and message we find the entirety of the Old Testament distilled and offered to the Church. Of that message, I would mention three things. Firstly, John tells us to repent and that repentance is the only way to avoid the coming judgment of God. That judgment will be thorough—not a little pruning of a few stray sinful branches, but the felling of the whole tree. And repentance is urgently required, that that judgment is even now impending and threatening. The axe of divine judgment is being laid at the root to the tree; the first blow of the axe is imminent, and there is no time to lose. One might perhaps imagine that being part of a religious body would be enough to save. It is not so. Many Jews imagined that as the children of Abraham and members of the Chosen People they were immune and safe from divine wrath. That wrath was for the Gentiles, not for Jews. They were the children of Abraham, and were therefore safe. John thundered against such presumption. Being a child of Abraham was no great thing: “Do not presume to say to yourselves, ‘We have Abraham as our father’, for I tell you God is able from these stones to raise up children to Abraham” (Matthew 3:9). (This probably involves a play on words which vanishes in translation: from these stones [Hebrew eben] God is able to raise up servants/ sons [Hebrew ebed].) If the Jews of old were not saved by racial membership, neither are we Gentiles by ecclesiastical membership. What matters is repentance, which alone gives meaning to our inclusion in the Body of Christ. Repentance is not something we do before we can serve God; it is what serving God consists of. Secondly, we may ask what do we repent of? What does God want from us? The Pharisees were sure that repentance consisted of scrupulous attention to the minutiae of the Law, and fastidious care in keeping the Sabbath and ritual purification. A truly devout person would wash one’s hands before eating just in case they had contracted ceremonial defilement in the marketplace (see Mark 7:3f). Is that what repentance looks like? Does God primarily want us to be more religious? John taught otherwise. Repentance consisted of care for the poor and of contentment with one’s lot. “He who has two coats, let him share with him who has none; and he who has food, let him do likewise” (Luke 3:11). Notoriously sinful tax-collectors? Let them “collect no more than was appointed” for them, cheating no one. Soldiers? “Rob no one by violence, and be content with your wages” (v. 12-14). Here we see the explication of the constant theme of the Old Testament prophets. All the prophets denounced social injustice and said that to know God was not to be religious, but to be kind to the poor (Jeremiah 22:16). One of them, Micah, summed it all up: “He has showed you, O man, what is good—what does Yahweh require of you but to do justice and to love kindness and to walk humbly with your God?” (Micah 6:8) The first and great commandment to love God manifests itself in its corollary, the commandment to love your neighbour as yourself. If you love God whom you have not seen, you will surely also love your neighbour whom you have seen (1 John 4:20). John speaks these words to us as well. When our egos swell and we become angry at others, this is the sign that we must decrease, and let our egos shrink back to a normal size. Jesus Christ must increase in our lives so that all our attention is on Him. John was not just the Baptizer, he was the Forerunner, and his life had no other purpose than to reveal Christ and prepare His way. From his place on our icon-screens, John tells us that we also have no other purpose but to serve the Lord. Today is a little Great Friday, a second Great Friday. 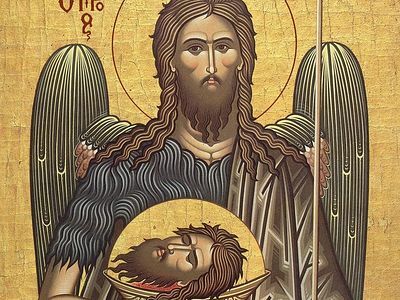 For today the greatest man among those born of women, John, the Holy Forerunner and Baptiser of the Lord, is murdered.